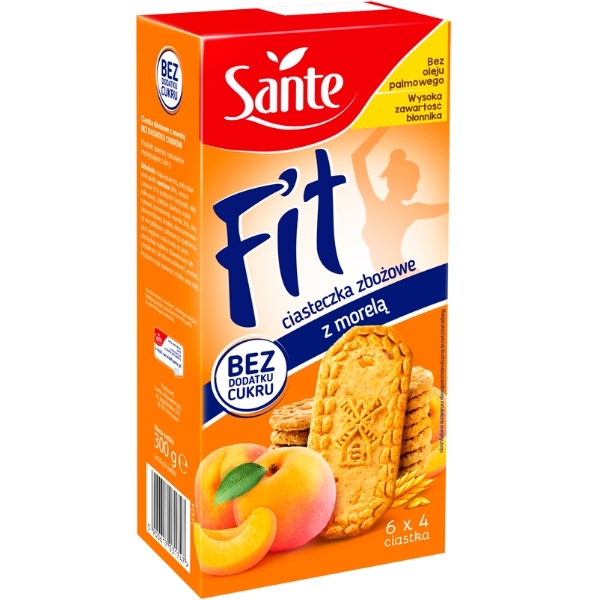 Breakfast cookies with apricot are tasty and nutritious and contain 52% grains, including wheat, wholegrain oat (26%) and rice, with dried fruit, including raisins, dates, peaches and apricots. The grains are a perfect source of energy for an active morning! 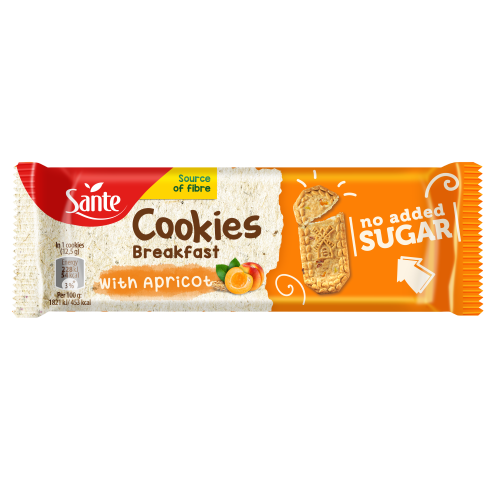 Sugar-free breakfast cookies with apricot contain inulin, which is a natural prebiotic. 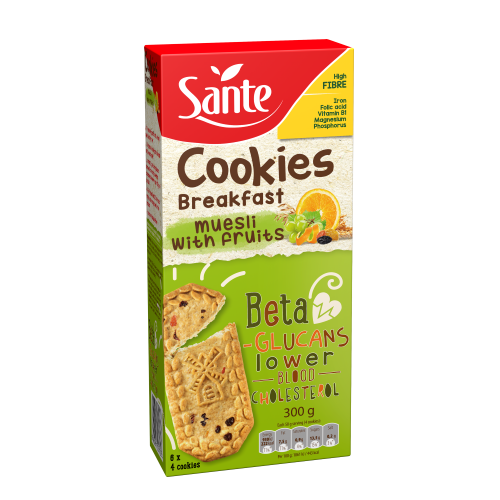 The cookies contain no added sugars, which makes them a perfect choice for those who want to cut down on sugar. 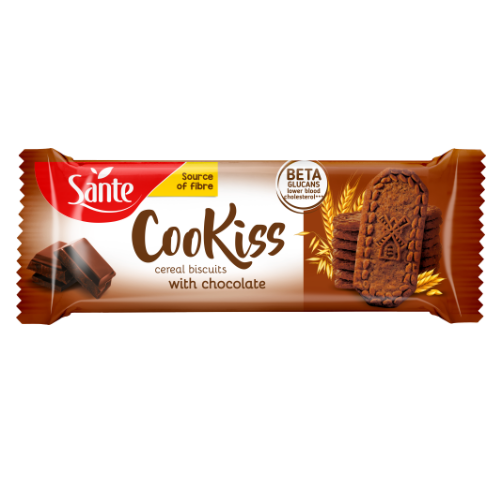 The sweet taste of the cookies comes exclusively from sugars that naturally occur in fruit. 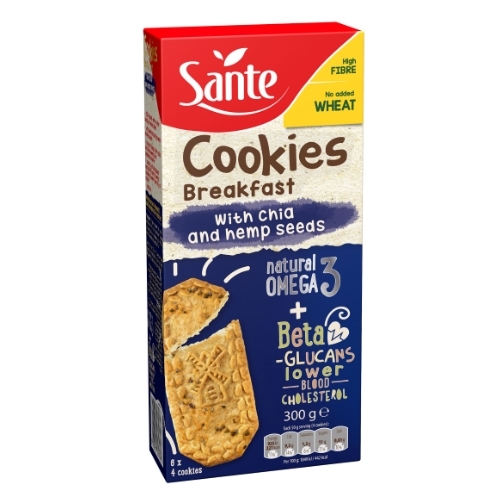 The cookies are a natural source of fibre, thiamine and minerals. 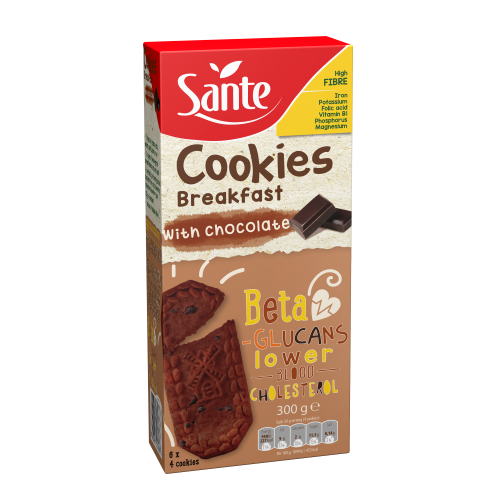 Now you can get your favourite Sante breakfast cookies in a handy pack of 50 g (4 cookies). You can take them with you wherever you go and reach for them any time you feel like eating a nutritious elevenses or a healthy snack. What makes our cookies so special? These sugar-free breakfast cookies with apricot enchant your palate your palate with their incredible corny and chocolate taste and crispness! 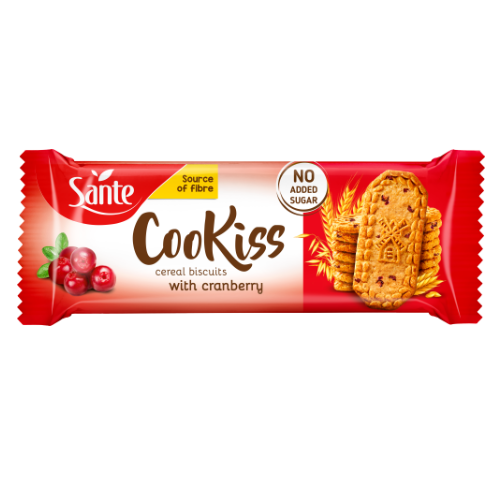 They taste great with a warm drink or yoghurt and fruit. When soaked in tea or coffee, they will melt in your mouth. 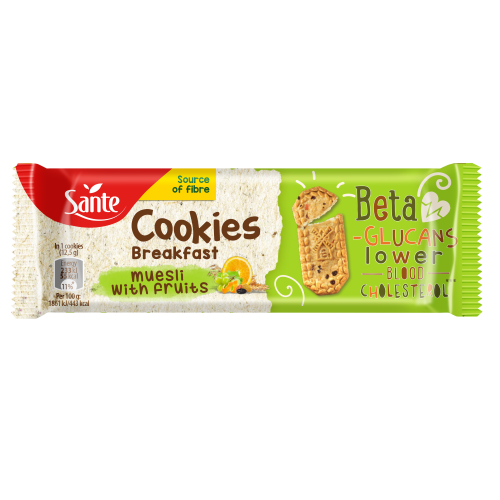 * This health effect can be achieved by regular consumption of one serving of sugar-free breakfast cookies with apricot (50g), combined with a balanced diet and healthy lifestyle. 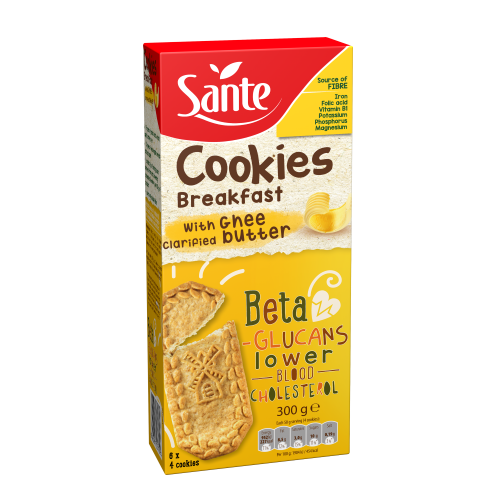 Cereal derived products 52% (wheat flour 26%,whole grain oat flakes 26%, rice flour), dried fruits 21% (raisins, dates, peach, apricot 2%), sunflower oil, inulin, concentrated apple juice, raising agent: calcium carbonates, vegetable oils (cotton oil or rapeseed oil or sunflower oil), natural flavouring. *RDI – reference daily intake for an average adult person.